SAN JOSE, Calif. – May 18, 2011 – Radicom Research, a leader in the modem industry, announced today the release of WiFiHU series of USB WiFi modem modules. With the WiFiHU modules, WiFi connectivity can easily be added to virtually any processor-based device. WiFiHU supports the latest wireless standards, including 802.11b/g/n, all through a USB 2.0 interface, at a price normally found for last-generation wireless hardware. With reliable transmissions, protocol stack and use of 1TX/2RX antenna technology, these high speed USB wireless devices achieve over-the-air data throughput up to 300Mbps downstream and 150Mbps upstream PHY rates using 40MHz bandwidth or up to 150Mbps downstream and 75Mbps upstream rates using 20MHz. The WiFiHU is designed for industrial OEM use. It features –40°C to +85°C extended operating temperatures in a small footprint, and it comes with WEP/WPA/WPA2 security protocols to protect the host. Other specifications include firmware and configuration parameters stored in on-board NVRAM and low overall power consumption. Radicom's WiFiHU series comes in two models: WiFiHU-a and WiFiHU-c. WiFiHU-a has dual-chip antennas built in to eliminate the need for costly and time-consuming RF development, creating shorter time to market. 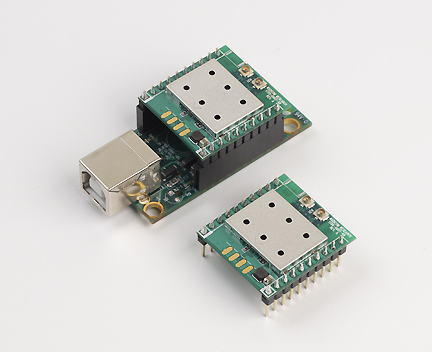 WiFiHU-c has two U.FL connectors to attach antenna cables and antennas, giving OEM engineers the flexibility to place antennas in locations best suited to their design. WiFiHU-a and WiFiHU-c are available now with prices starting at US$19.00 in quantities of 1,000 pieces. Bulk discounts are available for higher OEM volume requests. Customized OEM specifications and private labeling are welcome. Founded in 1993, Radicom Research develops reliable, high quality, simple to implement dial-up and wireless modems, competitively priced. Headquartered in San Jose, California, with offshore manufacturing capabilities. Radicom specializes in designing and manufacturing embedded modem modules for OEMs. Radicom modifies its award-winning modems to meet specific requirements, and designs custom products to fit special needs. OEMs and product designers are invited to contact Radicom Research for consultation and help in implementing these state of the art WiFi modem modules to efficiently meet their system applications. Phone: 1-408-383-9006, ext. 112; Fax: 1-408-383-9007; Email: sales@radi.com; Website: www.radi.com .